It's not you: The search for true love is more difficult now than ever before. To find out why and what to do about it, Jillian Straus conducted in-depth interviews with 100 single men and women in their twenties and thirties. 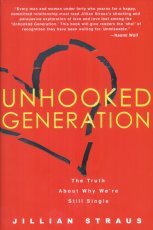 She shares their eye-opening stories and her provocative findings in Unhooked Generation -- the book that everyone, male or female, must read in order to understand why it is they can't seem to make their relationships last. Peter -- He's had serious relationships with five women, and he says he could have married four of them. But he was always afraid that something better might be around the corner. Leanne -- Beautiful and successful. When she was younger, marriage wasn't a priority. Now in her thirties, she's starting to worry if she loses her youthful appearance, she'll become less "marketable." Lisa -- She finds out after a date that Sam was turned off by her because she seemed uncomfortable letting him pay for dinner. Simon -- He's been out with fifty women he's met online over the last two years. He slept with half of them but can't seem to find what he really wants: a girlfriend. Marissa -- She broke up with Phillip, a nice guy except for the fact that he only IM's her, and never calls. All of these are part of the "unhooked generation," men and women who are searching for love in an uncommitted world. This book doesn't just point out the problems, it will show you the secrets to effectively sidestep them -- once and for all.